BrandWorks was engaged by Ararat Rural City Council to breathe fresh life into two important cultural institutions as part of an historic redevelopment of its Arts Precinct. The aim was to build two new, unique identities for Ararat Regional Art Gallery and Ararat Performing Arts Centre. These two rebrands needed a unity in overarching thinking while highlighting the independence of each institution. Williams Boag Architects were engaged to redevelop the existing site, and their approach mirrored our own. We studied the past, present and future of Ararat, exploring the tensions and harmonies between the new and old in the aim of finding a fresh direction for each brand while truly honouring their history. Keeping one foot in the past, we took inspiration from the stencilled wool bales that are ubiquitous in this wool growing district where “AAA” signifies high grade Merino. These three letters are conveniently present in the name Ararat, a visual gift we had fun leveraging. Both brands also move towards the future through a process of reduction and through pairing with contemporary typefaces from leading foundries. 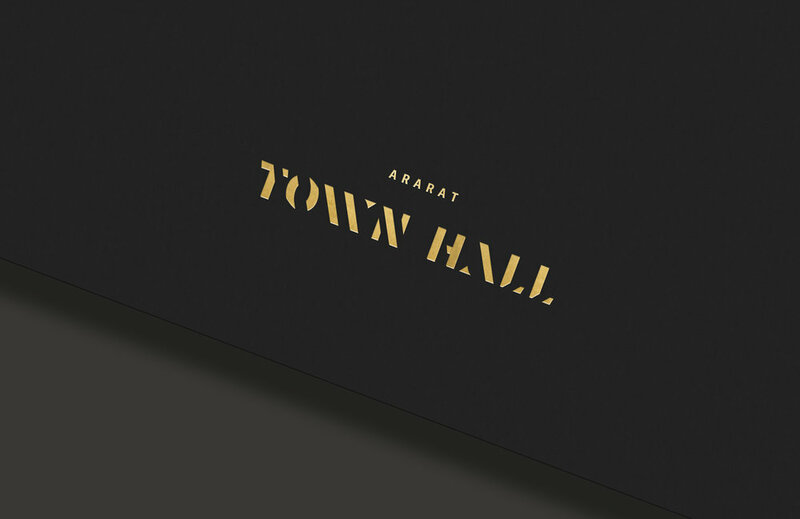 The Ararat Town Hall not only holds a prime position as a centrepiece of the streetscape of this regional city, it also holds a special place in the heart of the community. It's the home of Ararat’s civic and cultural heritage and has acted as a performing arts centre since 1979. 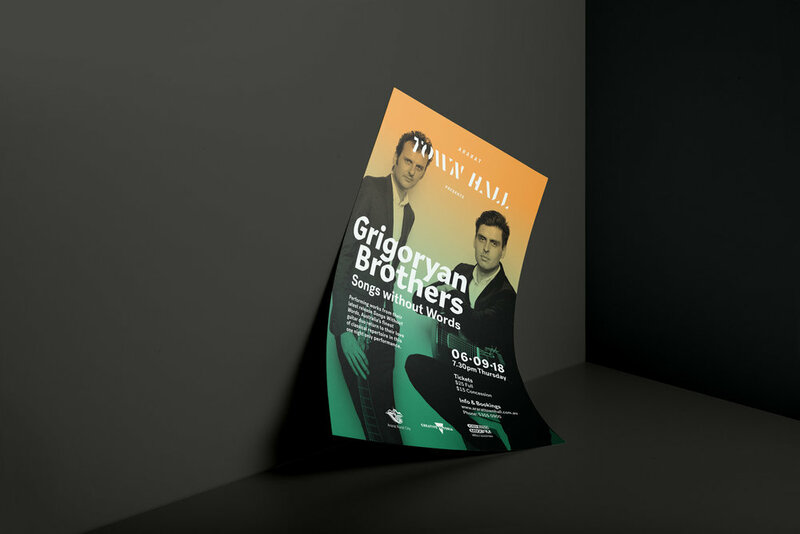 Ararat Town Hall now presents an extensive annual program of touring works of theatre and music as well as hosting local ensembles and eisteddfods. The theatre itself is a dramatically black, cavernous room, in stark contrast to the white, spacious walls of the art gallery. 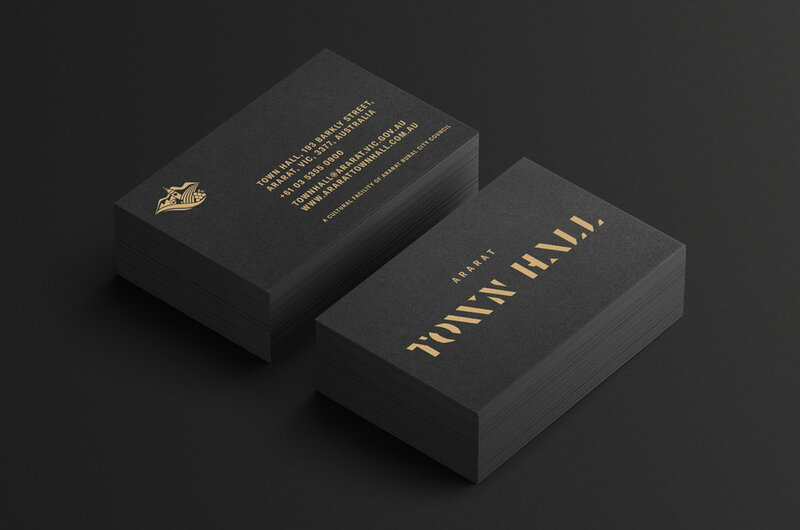 The brand colour palette responds directly to this notion through a base of black and gold. It then expands and adapts with vibrant saturated colours, applied as a gradient wash over photography, like coloured gel lights on stage. This responsive palette allows for a fresh, ever changing, yet consistent visual treatment for seasonal promotional material.